Car and Driver says the all-new Subaru Ascent doesn't stand out, yet it still earns their Editors’ Choice award. See what one thing is chief among its merits. When Subaru axed the Tribeca from their lineup it was because it was too small for their customers with families. 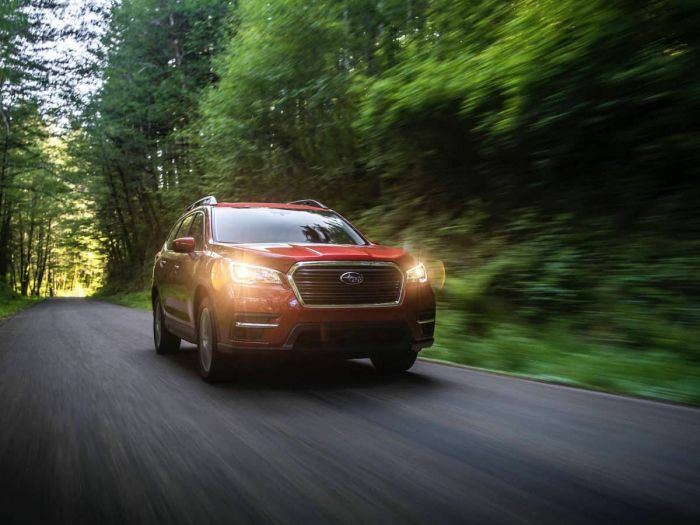 Enter the all-new 2019 Subaru Ascent which is now the largest vehicle Subaru Corp has ever made, and it’s built specifically for North American families. Car and Driver says the all-new 2019 Subaru Ascent is not really “superlative” or outstanding in any single area, but Subaru priced it right for families. Even though it doesn’t stand out in the crowded 3-Row segment, the new 2019 Subaru Ascent earns Car and Driver Editor’s Choice Award. C&D used a wide range of criteria pulling the results from their Buyer’s Guide in-depth testing, how a vehicle performed at their test track, “or just old-fashioned subjective desirability.” But it’s low starting price is what sets it apart from all other 3-Row vehicles. Why did C&D choose Ascent? The Subaru Ascent has a starting total MSRP of $32,970 for the base model making it one of the lowest priced 3-Row SUVs out there. The Ford Explorer Limited 4WD starts at $45,235, Toyota Highlander Limited FWD ($43,325) and Honda Pilot Touring AWD ($44,865). The well-equipped Subaru Ascent Limited still comes in lower at $39,970. (all pricing includes destination). The base Ascent trim ($32,970) comes standard with Symmetrical All-Wheel Drive with X-MODE, three rows of flexible seating for 8 passengers, standard EyeSight driver assist technology, Subaru STARLINK Multimedia with Apple CarPlay and Android Auto, raised roof rails, and 18-inch alloy wheels. The upper trim Ascent Limited ($39,970) comes with leather seats, 20-inch alloy wheels, all-weather package w/ heated front and second-row seats, power rear gate, keyless access with push-button start, and 10-way power driver’s seat w/ memory function. The all-new 2019 Subaru Ascent scores Car and Driver Editors’ Choice Award not because it’s outstanding in any single measure, but because Subaru made it the most affordable 3-Row out there for families.